Thank you for PrintoCent -folks for organising really great event in the right time of the year at Oulu. The program was smashing and there were a lot of interesting talks. Again thank you for all the visitors in our booth at Prince’16. Hope that you has as good time as we had. We had great week at Oulu – combined with the Innofest’16 and Midnight Pitch. The printed electronics superweek was once again success. For all the new ideas you will hear in the future. The nights at oulu are really bright, the following photo could have been taken at 4am, and just to be sure, we were awake at 4am. But of course I forgot to take the pictures at time. 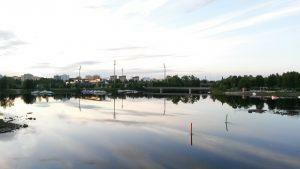 The summer nights at Oulu are quite bright. This picture was taken 11pm. Is there something else you would like to know?